HOME "Global warming or cooling...hmmmm"
Think you know something about Earth's climate? Think the present climate is as good as it gets? Think the Earth is in serious danger of overheating? What's the usual climate during the past few million years? Why is Panama the key to improving the climate? 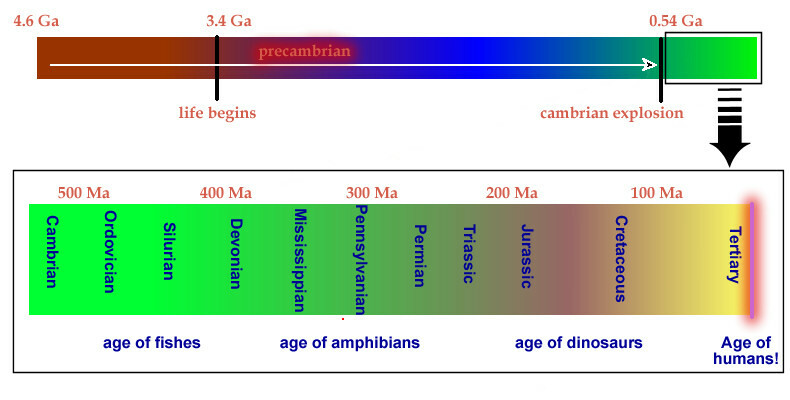 What's the Golden Age, the Eocene and the Eemian? Were they better or worse than today? Warmer or cooler and by how much? Chicago in the geologically fleeting warmth of this interglacial period. won't be standing. They will be ground to dust under the weight of a mile of ice. Earth is now warmer than it's ever been and it's all our fault. and it is all due to our lifestyle. Is that true? Is it warmer now than it has ever been? Russian Arctic with a few dozen other scientists to find out. What do you know? She found there are many periods when it has been much warmer in the Arctic than it is now. Not just a few degrees like during the last interglacial period, the Eemian. More like 14F warmer. Greenland had no ice at all and yet the Earth was just fine. Click the picture to see the video. 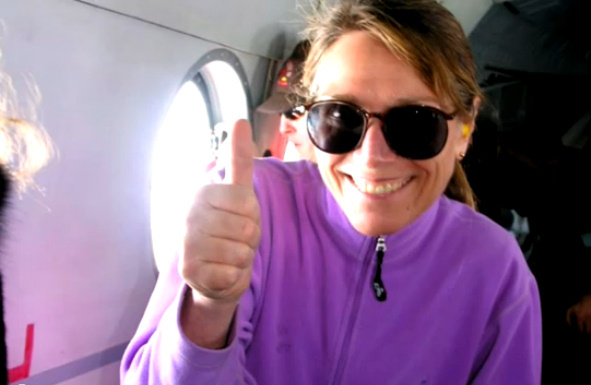 Thanks, Julie, for taking the time and enduring the hardships to gather real data. CAGW Deniers are all Nuts! The reason this matters is that there is a close correlation between variations in the sunspot cycle and Earth's climate. The previous time a cycle was delayed like th is was in the Dalton Minimum, an especially cold period that lasted several decades from 1790. There is no doubt that the next little ice age would be much worse than the previous one and much more harmful than anything warming may do. There are many more people now and we have become dependent on a few temperate agricultural area s, especially in the US and Canada. Global warming would increase agricultural output, but global cooling will decrease it. The interglacial we have enjoyed throughout recorded human history, called the Holocene, began 11,000 y ears ago, so the ice is overdue. We also know that glaciation can occur quickly: the required decline in global temperature is about 12C and it can happen in 20 years. Australia may escape total annihilation but would surely be overrun by million s of refugees. Once the glaciation starts, it will last 1000 centuries, an incomprehensible stretch of time. We also may be able to release enormous floods of methane (a potent greenhouse gas) from the hydrates under the Arctic permafrost and on the continental shelves, perhaps using nuclear weapons to destabilize the deposits. It will be difficult for people to face the truth when their reputations, careers, government grants or hopes for social change depend on global warming, but the fate of civilization may be at stake. Phil Chapman is a geophysicist and astronautical engineer who lives in San Francisco. He was the first Australian to become a NASA astronaut. Copyright 2008 News Limited. All times AEST (GMT +10). And Chapman is not the only NASA astronaut that's a major nut....read more. 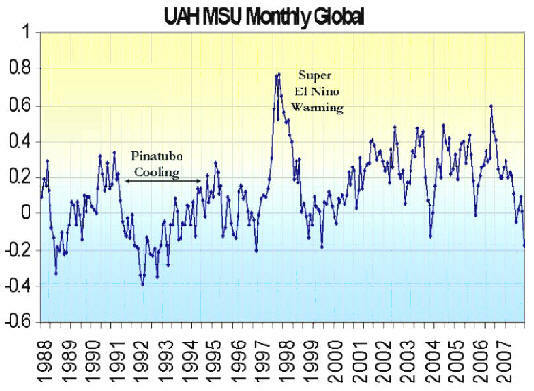 A quick check shows that slight global cooling has continued since 2008 when Chapman wrote the above. born in one of the brief interglacial warm periods. On the other hand, here we are in Icehouse Earth instead of Greenhouse Earth. The reality is the Earth is in an ice age and has been for almost three million years. Mankind has never known normal Earth climate. We need to start thinking long term to get a handle on the climate issue. Not ten years or fifty or a hundred or even a thousand years. Horizons must expand to millions of years. has no bearing on the issue being presented here. An issue of utmost concern for all life on Earth. "The Greenest Project Ever Conceived." An unflinching look at the reality of our situation. that no one is talking about...yet. all you gotta do is read and watch." Greenhouse Earth or Icehouse Earth? Since the dawn of time for humans, we have been blissfully unaware of our precarious situation on this planet. Until recently we did not have the facts or the science or the history. We assumed huge masses of ice were benign and best ignored. Out of sight; out of mind. We thought the current climate was optimal and it would go on forever. Who knew? We are in an ice age with a climate almost as cool as it has ever been, far from "earth normal" and far from too warm! This will be a surprise to you if you get your information about climate from the evening news. If you live in the tropics you may be thinking: "What ice age?" If you live further north or south of the equator you may be thinking: "Nonsense, we have lovely springs, summers and falls." But what about winter, cruel winter, when vegetation dies and animals suffer. Winter is what it means to live in an ice age, in Icehouse Earth, where humans can not survive without fire, clothing and shelter. We are not made for it. We are made for Greenhouse Earth. This graph shows the temperature history of the Earth. Today is on the far right side. During the last 2 billion years the Earth's climate has alternated between an "Icehouse", like today's world, and "Greenhouse", like the world of the dinosaurs and the early mammals. Even had our ancestors known the truth, they had no means of changing the course of the ice age. There is now a scientific consensus that mankind has recently caused the globe to warm if only a little. If this is true, and let us hope it is, then we can melt the ice sheets and stop this massively destructive freeze/partial thaw cycle we find ourselves in. Unfortunately, recent revelations cast serious doubt on AGW, Anthropogenic Global Warming. Other mechanisms will likely need to be employed. We've had the technology and the idea for nearly fifty years. It is conceivable that mankind may choose not to break out of the ice age at all. What then? People have adapted well to the moderate natural warming since the last glacial period. It is now ten or fifteen degrees warmer than the last glacial maximum eighteen thousand years ago. Warming is good. If it drops ten or fifteen degrees we will not be able to adapt well. We and the Earth can easily handle more warming and more CO2. The atmosphere is said to have less than 400 ppm currently. What happens if that triples? The existence of the ice age is now common knowledge in the science community. It was generally unknown prior to October 7, 1840 when it hit the papers in Scotland. It was not accepted by the scientific community for many decades. Prior to that it was commonly thought that the earth had been gradually cooling from it's molten state long ago. Watch this informative BBC special, Men of Rock: The Big Freeze. Is CO2 a pollutant and a 'bad' gas? Previous interglacials were actually warmer than now. If we do nothing, sooner or later, the warmth will go. The ice will come again. That process may even now have started. How does one adapt to a mile of ice overhead? Expect a mass extinction event. Civilization as we know it will be in danger of disappearing for at least 100,000 years. Science and technology will be very difficult to maintain. Homo Sapiens will be in extreme survival mode. QUIZ: Is it Greenhouse Earth or Icehouse Earth conditions now? Did you guess Greenhouse Earth? Please make another choice. We are in an Icehouse situation, an ice age, quite far from a Greenhouse Earth period. What was the climate in the past? Is it currently the hottest it's ever been? Is the current climate the norm? Is the current climate optimal? When and what was the Golden Age? Why is Panama the key? What if we can't stop the ice age? "The Earth has experienced at least five major ice ages. in high latitudes. "...meaning the poles. 1. The earliest well established ice age is called the Huronian. From 2.4 to 2.1 billion years ago. called the Cryogenian period. Also known as Snowball Earth, glaciers may have extended to the equator. 3. The Andean-Saharan was a minor ice age from 460 to 420 million years ago. and cut off circulation between the oceans. 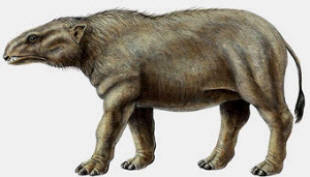 Called the Pleistocene, it is defined as having ended about 10,000 years ago. Don't confuse this with the end of the ice age itself. The ice age continues in full force as you will see. QUIZ: When did modern man live in other than an ice age? Trick question. The answer is never because modern man, Homo Sapiens, has only been around a couple hundred thousand years while this current ice age is nearly three million years old and counting. 2.4 Billion Year Timeline. Ice free conditions prevailed more than 72% of the time! "From about 200 million years ago to 149 million years ago was the golden age for dinosaurs, The Jurassic." that was nearly all green, pole to pole." -50°C (-58°F). Back then at the poles the average was 32 °F and 77 °F at the equator, about like Key West, Florida, today. A very good time for life on Earth. "During the Campanian stage of the Late Cretaceous (80 Ma), evidence suggests mean annual temperatures were 7-14 K warmer than today. There is no evidence of significant ice at high latitudes... Late Cretaceous atmospheric CO2 was much higher than today, with levels estimated from 2 to 9 times present day. In addition to the warmer surface climate, oxygen isotope estimates from deep sea sediment cores suggest that the deep ocean was as much as 15 K warmer during the Cretaceous. This was a period of great success for dinosaurs, with many new types appearing and diversifying. Birds became increasingly common and diverse, replacing the pterosaurs which retreated to increasingly specialized ecological niches. 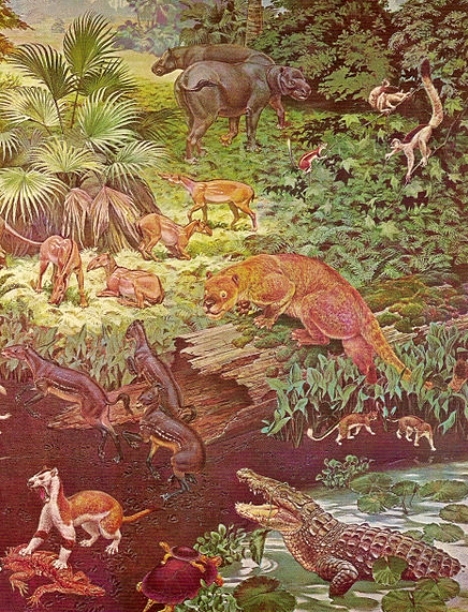 Didelphid marsupials and primitive placental mammals also became common. 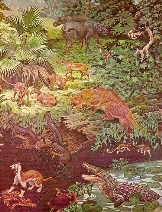 Still, mammals remained small. In Cretaceous temperate regions, familiar plants like magnolias, sassafras, roses, redwoods, and willows could be found in abundance." far north as Eugene, Oregon and Bangor, Maine. 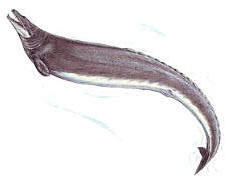 from the Greek and refers to the "dawn"
and teeming with fish and other sea life. Needless to say the Earth had no ice sheets. Another very good time for life on Earth. QUIZ: During Greenhouse Earth periods the entire Earth heats up about the same amount, true or false? The poles heat up much more and the temperature gradient between the equator and the poles is half what it is today. This one is false. "The Eocene greenhouse event fascinates scientists not just because of its effects, which also saw a major mass-extinction in the seas, but also because of its likely cause: methane hydrates. This unlikely substance, a sort of ice-like combination of methane and water that is only stable at low temperatures and high pressure, may have burst into the atmosphere from the seabed in an immense “ocean burp”, sparking a surge in global temperatures (methane is even more powerful as a greenhouse gas than carbon dioxide). Today vast amounts of these same methane hydrates still sit on sub-sea continental shelves. As the oceans warm, they could be released once more in a terrifying echo of that methane belch of 55 million years ago." the unfortunate rapid glaciations of our present era. An increase of 6 ºC should be enough to melt the ice sheets. The present climate is clearly not the warmest ever. 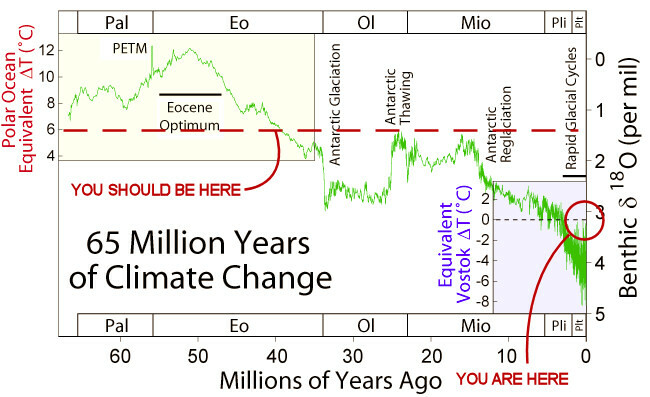 Temperatures have been decreasing for 55 million years. Are we headed for another Snowball Earth? Hope not. Pil = Pilocene; Plt = Pleistocene. "The leaping capabilities make Teilhardina most likely a tree-dweller too, says Rose, which is an incredibly different habitat than the badlands of Wyoming today, which are dry and rocky with little vegetation. These creatures lived during a period of global warming, when subtropical climates and vegetation stretched all the way to the Arctic Circle, explains Rose." 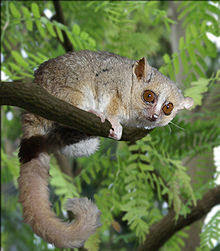 The mouse lemur is alive and well in Madagascar. reaches the latitude of Columbus, Ohio and beyond. During more recent glaciations at the maximum it is estimated 30% of the Earth's surface was covered in ice. Permafrost extended southward from the glaciers hundreds of miles. was 21 ºF, and was 32 ºF at the edge of the permafrost. The habitable zone was greatly reduced. Arable land was greatly decreased. North America was experiencing Arctic or tundra climate for the most part..
temperature-wise. But that was not all. and more extensive. Rainfall was lower. From sediment cores we can trace temperatures over millions of years. 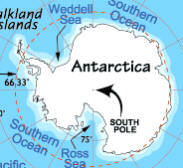 This chart shows changes as it may have been at Vostok, Antarctica. The overall trend has been downward. The Mammoth lived during most of this periord, from around 4.8 million years ago to about 4,500 years ago. 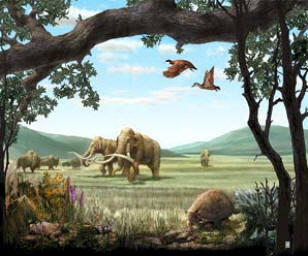 The period from 5.3 to 2.8 million years ago is known as the Pliocene epoch. Many think the earth is now headed for a similar climate, warm and humid, by 2300. 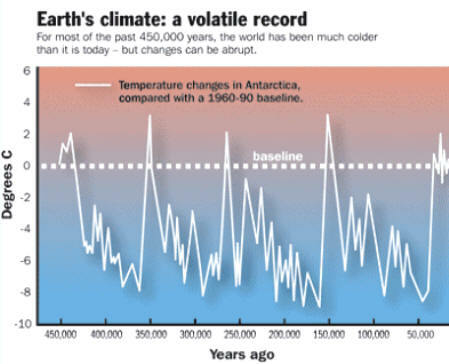 After continual cooling for 50 milion years, the earth entered the current ice age about the middle of the above chart. Known as the Quaternary glaciation, Pleistocene glaciation or the current ice age, it began about 2.8 million years ago and continues until today. It is distinguished by the presence of at least one permanent ice sheet in Antarctica and possibly Greenland with others coming and going. What caused the earth to sink into the current ice age? No final theory is widely accepted. It may be related to Milankovitch cycles and orbital forcing, atmospheric composition, plate tectonics, ocean currents, ocean volcanism, solar output or magnetic reversals...or some combination of these factors. "Some researchers, such as James Lovelock (1995) and Lynn Margulis (1992), suggest that biologic organisms have played an integral role in stabilizing and regulating the Earth's climate system. Their Gaia hypothesis suggests that biologic processes serve as a climatic thermostat, preventing Earth from freezing or a runaway greenhouse effect." "The Great Global Warming Blunder unveils new evidence from major scientific findings that explode the conventional wisdom on climate change and reshape the global warming debate as we know it. Roy W. Spencer, a former senior NASA climatologist, reveals how climate researchers have mistaken cause and effect when analyzing cloud behavior and have been duped by Mother Nature into believing the Earth’s climate system is far more sensitive to human activities and carbon dioxide than it really is. In fact, Spencer presents astonishing new evidence that recent warming is not the fault of humans, but the result of chaotic, internal natural cycles that have been causing periods of warming and cooling for millennia. More carbon dioxide in the atmosphere is not necessarily to be feared; The Great Global Warming Blunder explains that burning of fossil fuels may actually be beneficial for life on Earth." "Roy W. Spencer is a Principal Research Scientist at the University of Alabama in Huntsville. He was formerly a Senior Scientist for Climate Studies at NASA. He is co-developer of the original satellite method for precise monitoring of global temperatures from Earth-orbiting satellites. He has provided congressional testimony several times on the subject of global warming and authored the 2008 New York Times bestseller, Climate Confusion." During the past 700,000 years there have been at least seven major episodes in which glaciers have covered large portions of the planet. Temperatures have been at the present beneficial level only about 5% of the time during this period. We are in an ice age and very lucky to be living in one of the rare warm periods. Our problem is how to break out of this ice age and avoid the coming of it's next glacial period. Venus of Berekhat Ram, 230,000 - 700,000 BCE. at 12 ºC. You can also see we are overdue for the next glaciation. During that time there were four interglacials that were from 2.5 ºC to almost 4 ºC warmer than present, 6 ºC on other graphs. Over and over the earth tries to right itself only to fall back into another icehouse period. All of human written history has occurred during the current brief period of warmth. All of mankind's technology, beyond fire and stone tools, has been developed in the Holocene. I suspect we will need every bit of it and more. A visualization of the last ice age using a global ice sheet model with pro-glacial lakes included. This was the time of maximum ice extent during the last period of glaciation. A total of about 80,000,000 km3 of ice. Map above showing the recent glacial maximum. Compare with the map below of snow cover from last winter. Below is "Ice Age Columbus" video from Discovery Channel, the first of nine parts.. Very interesting. Gives us some idea what a glacial period is like. Cuffy and Clow, 1977, Greenland ice core records. For the past 10,000 years it has been almost always warmer than now. 12,000 years ago the globe relapsed into a glacial period, the Younger Dryas, after a very brief warming. 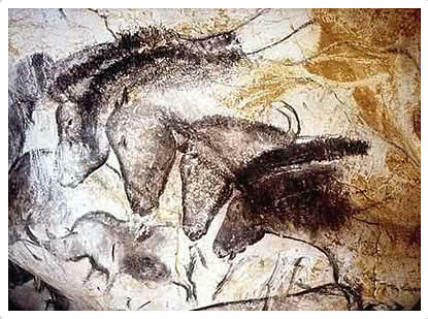 From Chauvet Cave about 15,000 years ago. "Natural global warming much more intense than modern warming has occurred many times in the geologic past...", says Dr. Don Easterbrook, WWU. "Fifteen thousand years ago, temperatures rose 10 to 20 degrees in just one century," he said. The Older Peron was a period of lovely warm climate during the current warm period, the Holocene Epoch. It began about 7000 years ago, and lasted to about 6100. The Older Peron was a period of generally clement and balmy weather conditions that favored plant growth. Warm temperatures forced a retreat in the glaciers and ice sheets of the global cryosphere; throughout the period, global sea levels were 2.5 to 4 meters (8 to 13 feet) higher than the twentieth-century average. At least a few commentators — anthropologists, folklorists, and others — have linked the era of the Older Peron transgression and the Neolithic Subpluvial with tales of a "time of plenty", the Golden Age or Garden of Eden, that occur in the legendary backgrounds of many cultures. It is interesting to note that this Golden Age sounds very much like conditions many climate scientists now predict with inappropriate alarm. It would be a great improvement over present conditions. "If you think I am being too harsh on Dr Hansen, ask him why he does not use the Holocene Thermal Optimum as his reference period. The Holocene Climate Optimum was a period of rapid warming that occurred during the early Holocene (8000 to 4000 years ago) when temperatures rose to between 1.5 to 3 degrees Celsius (3 to 6 degrees F) higher than in 1960. In the tropics this period was marked by higher rainfall, accounting for human occupation of the Sahara Desert. That warm period was probably the climatic basis for the legendary Garden of Eden. A study of the rise and fall of civilizations shows that the most hazardous times for humans is during cold periods not warm periods. But of course, Henny Penny would not have attracted much attention running about telling everybody that the sky was where it ought to be and thus not a serious cause for concern." Comment on a recent scienceblog.com post. 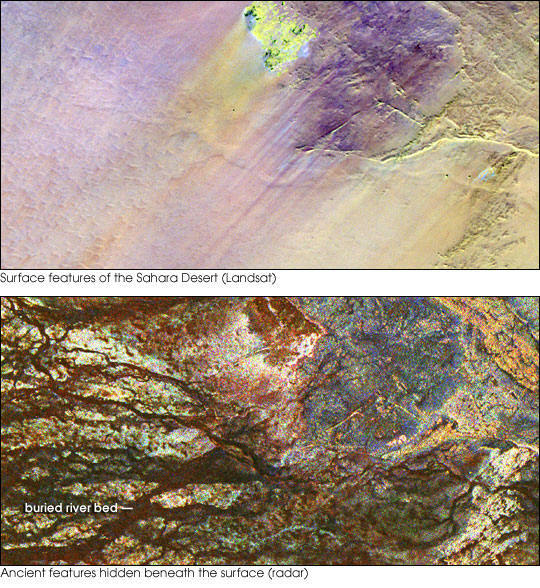 The Sahara Desert was not always a desert. During cooler periods as we now have, the Sahara is usually very dry. When the temperature of the mid-latitudes rises 2 or 3 C the Sahara experiences a wet period with increased monsoonal precipitation and becomes a savanna grassland. The last time this happened was in the current interglacial period. 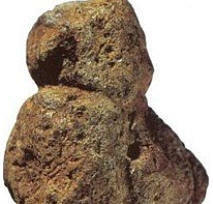 It began to phase in about 14,500 years ago and was over about 5,000 years ago. The peak was about 6 or 7,000 years ago. During much of the last glacial maximum the Sahara was more extensive than now. Tropical forests were greatly reduced. But, the Abbassia Pluvial, or wet period, occurred from about 133,000 to 122,000 years ago. The Mousterian Pluvial occurred from around 50,000 years ago to around 30,000 years ago. Old river beds visible under the sand. Climatologist Cliff Harris and Meteorologist Randy Mann. over the past 4,500 years. Are we headed for at least another 'Little Ice Age'. "During the Medieval Warm Period (800 to 1200 A.D.), the Vikings colonized Greenland. In his Perspective, Broecker discusses whether this warm period was global or regional in extent. He argues that it is the last in a long series of climate fluctuations in the North Atlantic, that it was likely global, and that the present warming should be attributed in part to such an oscillation, upon which the warming due to greenhouse gases is superimposed. Instrumental monitoring of the climate at high northern latitudes has documented the ongoing warming of the last few decades. Climate modeling has also demonstrated that the global warming signal will be amplified in the polar region. Such temperature increases would have important implications on the ecosystem and biota of the Barents Sea. This study therefore aims to reconstruct the climatic changes of the Barents Sea based on benthic foraminifera over approximately the last 1400 years at the decadal to sub-decadal scale. Oxygen and carbon isotope analysis and benthic foraminiferal species counts indicate an overall warming trend of approximately 2.6°C through the 1400-year record. 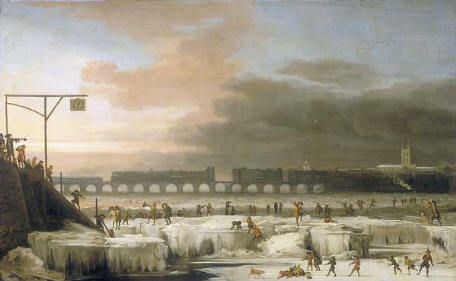 In addition, the well-documented cooling period equating to the ‘Little Ice Age’ is evident between c. 1650 and 1850. Most notably, a series of highly fluctuating temperatures are observed over the last century. 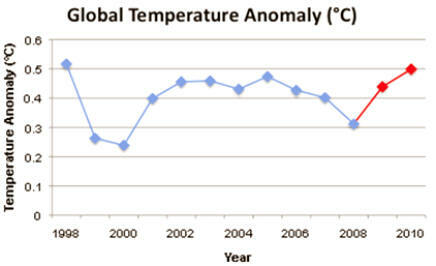 An increase of 1.5°C is shown across this period. Thus for the first time we are able to demonstrate that the recent Arctic warming is also reflected in the oceanic micro-fauna." 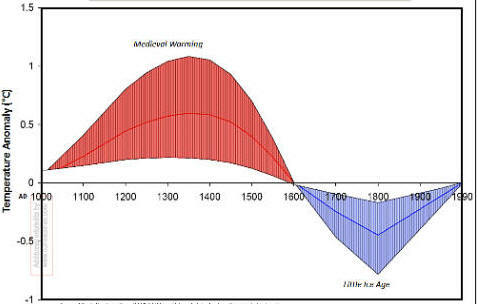 The Medieval Warming Period was beneficial as is the current warming. But, neither gives more than a hint of what Earth could be like with the grip of the ice age broken. "NASA defines the term as a cold period between 1550 AD and 1850 AD and notes three particularly cold intervals: one beginning about 1650, another about 1770, and the last in 1850, each separated by intervals of slight warming...The prevailing scientific view is that the Little Ice Age ended in the latter half of the 19th century or early in the 20th century. Timothy Ball and Syun-Ichi Akasofu, founder of the International Arctic Research Center at the University of Alaska, believe that Earth's climate is still recovering from the Little Ice Age. Burroughs analyzes the depiction of winter in paintings, as does Hans Neuberger. Burroughs asserts that this occurred almost entirely from 1565 to 1665 and was associated with the climatic decline from 1550 onwards. 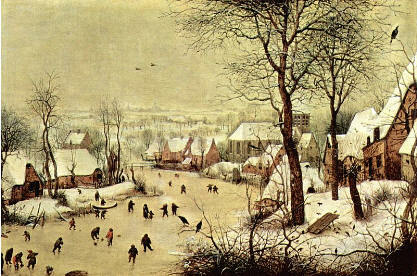 Before this, there were almost no depictions of winter in art, and he hypothesizes that the unusually harsh winter of 1565 inspired great artists to depict highly original images and that the decline in such paintings was a combination of the "theme" having been fully explored and mild winters interrupting the flow of painting. Neuberger analyzed 12,000 paintings, held in American and European museums and dated between 1400 and 1967, for cloudiness and darkness. His 1970 publication shows an increase in such depictions that corresponds to the LIA, peaking between 1600 and 1649. In North America, the early European settlers reported exceptionally severe winters. For example, in 1607-1608, ice persisted on Lake Superior until June. The journal of Pierre de Troyes, Chevalier de Troyes, who led an expedition to James Bay in 1686, recorded that James Bay was still littered with so much floating ice that he could hide behind it in his canoe on July 1." 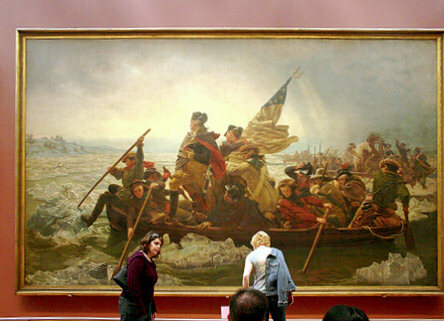 Washington crossing the Delaware, Dec. 25, 1776. Winter Landscape with a Bird Trap, 1565. This drop in temperature happened not all that long ago. It was the cause of a lot of starvation and misery. Snow lasted months longer. Glaciers advanced destroying fields and villages. Viking colonies on Greenland and Newfoundland died out. If this were to happen today, either from natural causes or unexpected consequences of attempts to cool the earth, the results will be catastrophic. What can we tell from temperature record over a short period of time like this? Doesn't appear to be going up much if at all. What does it say about the last 100 years? Nothing. The last 1,000 years or million years? What does it say about the future? To get any idea at all of trends we need a larger view as those presented above. Update: July 12, 2014...still no warming! 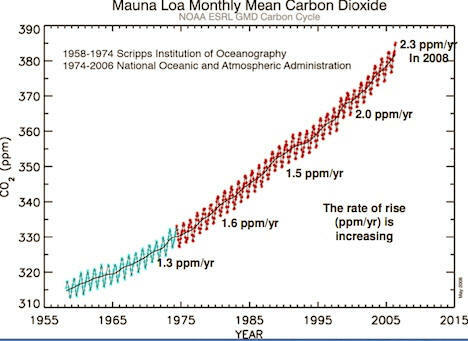 Compare the above two graphs with that for carbon dioxide below. CO2 is going up, up, up. Is the temperature going up, up, up? Not really. It appears that either CO2 is not the main mechanism driving climate or there are other mechanisms which easily over power any effect of CO2. This is why we need a lot more CO2 or a backup plan for boosting temperature. Can we count on CO2 alone to raise the temperature? at the start of the Pleistocene Epoch. How do we know we are still in an ice age? Because the Greenland and Antarctic ice sheets still exist. by traveling to either sheet. Total world ice is about 29,960,000 km3. Of that 29,340,000 km3 is on land, while 620,000 km3 is sea ice. In addition, it snows every winter. It's all mankind has known, but it's not normal or desirable. 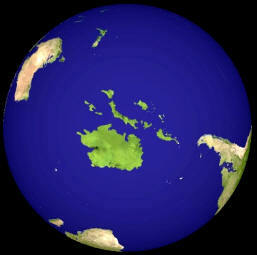 Existed about 3 million years ago. "Significant growth of ice sheets did not begin in Greenland and North America until approximately 3 million years ago, following the formation of the Isthmus of Panama by continental drift. This ushered in the era of rapidly cycling glacials and interglacials." 130,000 years ago ending about 114,000 years ago. above the Artic Circle at a latitude of 71º. generally warmer and wetter than now. 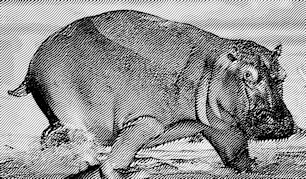 The Rhine and the Thames were home to Hippopotami. 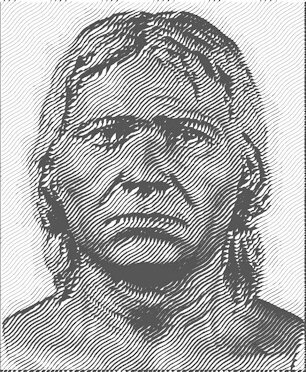 Cromagnon Man as he might have looked. During this period modern humans migrated from Africa spreading over the ice-free world. The Eemian was about 4 - 6 ºC warmer than the temperature today. Ice sheets and Arctic sea ice coverage were much smaller than at present. Much better than now, but still in the ice age. "The last time the Arctic was uncontestably free of summertime ice was 125,000 years ago, at the height of the last major interglacial period, known as the Eemian." The Present Interglacial interval is called Holocene. ended 10,000 years ago, but the ice age goes on. interglacials and continues to become even cooler. 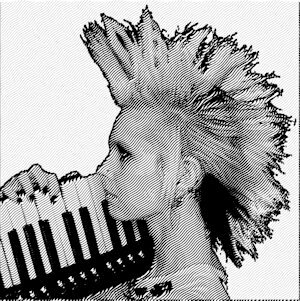 Punkrock Man, female, full regalia, late Holocene. It is coming, but when? "It is known that not all interglacial periods are of the same length and that solar heating varies in a non-linear fashion forced by the Milankovitch orbital cycles. At the same time, it is also known that greenhouse gases are increasing in concentration with each passing year. Based on the variations in solar heating and on the amount of CO2 in the atmosphere, some calculations of future temperatures have been made. According to these estimates, the interglacial period the earth is in now may persist for another 50,000 years if CO2 levels increase to 750 parts per million. The present atmospheric concentration of CO2 is about 385 ppm by volume, but is rising rapidly as humans continue to burn fossil fuels. If CO2 drops instead to 210 ppm, then the next glacial period may only be 15,000 years away." But this theory may not be right. 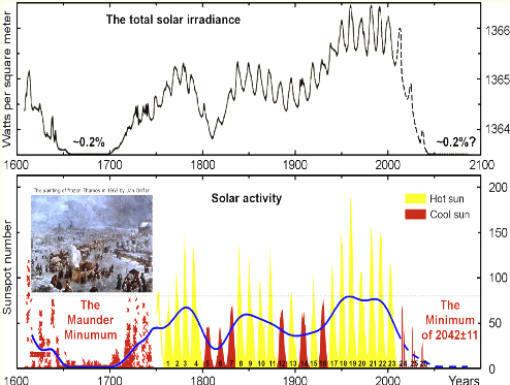 In a study of cyclic behavior of the Sun, Russian scientists now predict 100 years of cooling. Astrophysicist Dr Habibullo Abdussamatov, head of the Russian segment of the International Space Station, and head of Space Research of the Sun Sector at the Pulkovo Observatory of the Russian Academy of Sciences tells us that the sun dictates the climate of the Earth. 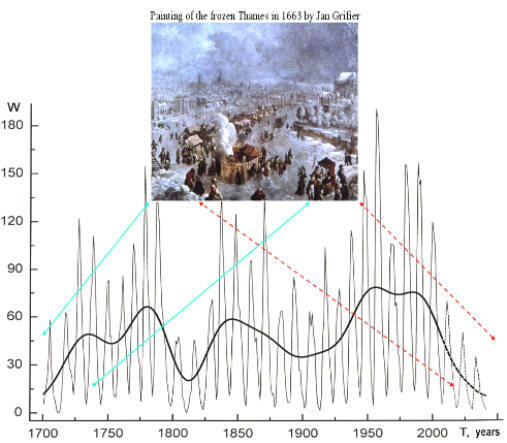 Russia’s Eugene Borisenkov** discovered a quasi 200- year cycle of global cooling during the past 7,500 years that correlates to times of sunspot minima similar to the Maunder minimum. This graph shows the 11 year sun spot cycle and the 200 year solar activity, the dark line. The Russian's prediction from 2009 to 2042 is the dashed line. The Russian forecast of solar activity to 2100, as low as the Maunder Minimum which is not good. Abdussamatov argues that total sun irradiance, or TSI, is the primary factor responsible for causing climate variations on Earth, not carbon dioxide. Carbon dioxide is "not guilty," says Abdussamatov. "As for what lies ahead in the coming decades, it is not catastrophic warming, but a global, and very prolonged temperature drop. There is now an unavoidable advance toward a global decrease, a deep temperature drop comparable to the Maunder minimum," he wrote. "Already there are signs of the future deep temperature drop. The observed global warming of the climate of the Earth is not caused by the anthropogenic emissions of greenhouse gasses, but by extraordinarily high solar intensity that extended over virtually the entire past century." "Future decrease in global temperature will occur even if anthropogenic ejection of carbon dioxide into the atmosphere rises to record levels." It is possible the glaciers could start quickly. "Studies of isotopic composition of the ice cores indicate the change from warm to frigid temperatures can occur in a decade or two... If the previous period was more typical than the present one, the period of stable climate in which humans flourished—inventing agriculture and thus civilization—may have been possible only because of a highly unusual period of stable temperature." When everyone else is buying, it's time to sell. Robert Felix, author and researcher, in a five part interview on Red Ice Radio, February, 2011, sound only. Humans have nothing to do with the climate he says in this straight talk about natural cycles, underwater volcanoes and magnetic reversals. You might want to skip ahead to 1:30 and avoid the annoying intro. "Nine stories of snow a day killed the dinosaurs, nine stories of snow a day killed the mammoths, and nine stories of snow a day will soon kill most of us." Robert Felix maintains that the oceans are heating up because of volcanism under the surface. As a result water vapor is added to the atmosphere which in turn causes increased precipitation. Don Easterbrook on The Looming Threat of Global Cooling - Geological Evidence for Prolonged Cooling Ahead and its Impacts, part 1 of 2. 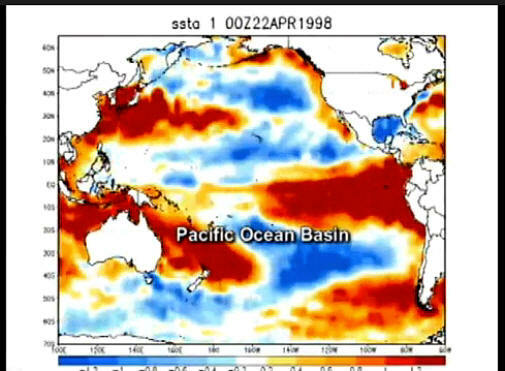 He discusses the Pacific Decadal Oscillation, or PDO, and predicts we are stuck in global cooling for the next 30 years. In a speech at a MIT-forum on ‘clean energy policy and climate change’ on April 13, Obama advisor on science and technology issues John Holdren, repeated his call for large-scale geo-engineering projects to combat ‘climate change’. Holdren explained that large-scale geo-engineering projects designed to cool the earth could ‘conceivably’ be done. But Holdren noted that shooting particles into the air—making an artificial volcano as one Nobel laureate has suggested—could have grave side effects and would not completely solve all the problems from soaring greenhouse gas emissions. So how do you learn more about the real world effects of geoengineering? You conduct tests and gather data. January 2009 "Take action: A rogue science ship is poised to carry out risky experimental fertilization of the Southern Ocean. This is likely [to be] the first of many coming attempts to begin geo-engineering the biosphere as a solution to climate change. The chemical cargo is likely to provoke a massive algal bloom big enough to be seen from outer space..."
Geo-engineering – artificial efforts to mitigate global warming by manipulating weather patterns, oceans, currents, soils and atmosphere to reduce the amount of greenhouses gases – evokes ideological, political and financial passions. For those who have more or less given up on UN climate talks, it is, along with nuclear power, the only practical planetary way to avoid catastrophic climate change; for others, it is an irresponsible move into the unknown by the rich world that will inevitably have unintended consequences, most probably for the poorest. A positive, unexpected benefit (usually referred to as serendipity or a windfall). A perverse effect contrary to what was originally intended (when an intended solution makes a problem worse), such as when a policy has a perverse incentive that causes actions opposite to what was intended. More recently, the law of unintended consequences has comes to be used as an adage or idiomatic warning that an intervention in a complex system tends to create unanticipated and often undesirable outcomes. Akin to Murphy's law, it is commonly used as a wry or humorous warning against the hubristic belief that humans can fully control the world around them. The unintended consequence of cooling the planet by geoengineering is triggering the onset of the next glacial period. The death toll will be in the billions. Doubly ironic since warming will be mostly beneficial for the Earth. QUIZ: The recent leveling of global temperature is, no doubt, part of a natural cycle, true or false? Hard to say for certain. If as is suspected government officials and scientist are testing geoengineering techniques to determine the best way to counter global warming, then it may well be anthropogenic. Ice does not promote life. Ice is a hazard to navigation. We have way too much of it. ice age for future generations? The Best Climate for Man? What sort of climate was the Wooly Mammoth best suited for? Huge, heavy and hairy...it would need lots of vegetation and cooler weather, right? “The woolly mammoth represents the end point in a series of adaptations to the Ice Age habitat,” write Adrian Lister and Paul Bahn in Mammoths. Extremely specialized to survive in the frigid Arctic, the woolly mammoth probably arose in Siberia but eventually inhabited a vast northern range extending from Ireland to the eastern North America. “Living south of the ice sheets, it inhabited a landscape of rich, grassy vegetation largely devoid of trees,” write Lister and Bahn. For a contemporary comparison consider the wild horse. It is well suited to very cold temperatures. "The human body is build to dissipate heat, while the horse's body is constructed to produce and maintain heat," says Tracie Lynn Thompson in her online article. "All warm-blooded creatures can tolerate a broad range of temperatures but each species has a natural 'comfort zone' that reflects the climate in which it evolved." The horses' cold adaptations include a massive digestive tract, legs with little muscle, a frost-bite resistant hoof, nasal structure, winter coat and seasonal fat layer. 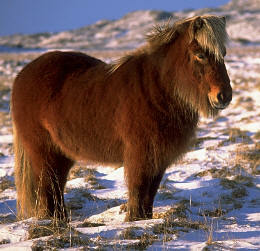 "The acclimatized horse is so ideally suited to the frozen tundra that - given adequate supplies of food and unfrozen water - he can survive and even thrive in temperatures as low as minus 40O F...Equus caballus is an evolutionary cold-weather marvel whose abilities for staying cozy in breath-stopping temperatures far outweigh your own." 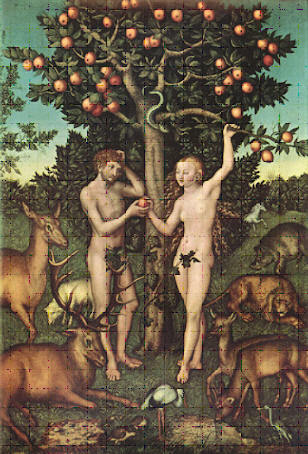 Adam and Eve, by Lucas Cranach the Elder, 1526.
were comfortable without clothing or shelter. What about humans? What climate are we suited for? Certainly not the same as the Mammoth or the horse. But like the Mammoth and the horse the answer is obvious and plainly expressed in your very own body. If you needed to spend a year or so outside without clothing what sort of conditions would you be hoping for? Frost bite, frost nip, chilblains, trench foot, UV exposure, hyperthermia and hypothermia must be considered. My guess is 80 to 90 degrees would be comfortable and conducive to wellbeing, plus not too wet and some trees for shade. Certainly no snow or ice. That is the climate we are naturally suited for. "Primitive man, without knowledge of the use of fire, insulative clothing or housing, had to live in areas with a constant environmental temperature close to his thermoneutral point. This point is approximately 27-28OC (80 - 82OF) in naked modern man at rest (Erikson et al., 1956) and this was evidently true of primitive man as well. There are areas close to the equator in which the mean annual temperature varies between 25OC (77OF) and 27OC (80OF) and the difference between the warmest and coldest month is as low as 1OC. This suggests that the birthplace of primitive humans was most probably near the equator. The mean temperature of the coldest month in polar areas exceeds -2OOC (-4OF) and is intolerable to unclothed man. Hence the humans who settled in cold weather regions had to develop clothing and housing. There is also scientific evidence that humans have adapted physiologically to cold. "In the 1950s and '60s, there was a great deal of interest in the thermoregulation of several original populations around the world and a reproducible field method was developed in which body temperatures, metabolic rate and other parameters could be followed during sleep (Scholander et al., 1958a). The subjects of these studies slept lightly clad overnight in a bag with their heads in boxes, which enabled collecting the expiratory respiratory gases. The ambient temperature varied between 0-6OC and the insulation of the bag was approximately 2 clo (clothing unit; 1 clo keeps a resting man comfortable at room temperature), ensuring a moderately intensive cold exposure....On the other hand, Australian aborigines from the central parts of the continent, who during that time lived almost unclothed outdoors, slept well and had a clearly lower metabolic rate and foot temperature during the all-night cold test than the white controls (Scholander et al., 1958b:Fig. 7)....Metabolic rate and rectal temperature of Alacaluf Indians from Tierra del Fuego did not change during the all-night cold test (Hammel et al., 1960)." "Hot-Wet. The hot-wet or hot-humid climates are typical of the tropical rain forests usually located within the latitudes of 10O to 20O above or below the equator. Hot-humid climates have the following characteristics: (1) the air temperature does not exceed 35O C (95O F), usually ranging between 26.7O and 32.2OC (80O to 90OF); (2) the average relative humidity exceeds 50%, usually reaching as high as 95%; and (3) there is marked seasonal precipitation. As a result of the high precipitation and hot climate, vegetation is quite abundant and provides ample shade...There is little day-night or seasonal variation in temperature and dew point." This is a good description of climate up to 45O latitude at times of Greenhouse Earth. The thermoneutral temperature for common laboratory animals has been determined: Mouse, hamster, rat, guinea pig, rabbit, cat, non-human primate, dog. All of these have a thermoneutral range from 22O C to 32O C. Non-human primates' range was 25O - 31O C. Very similar to hairless humans. 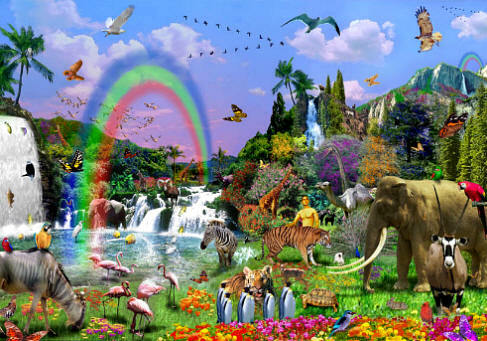 The common element is that all these mammalian species can trace their origin back to Garden of Eden conditions. 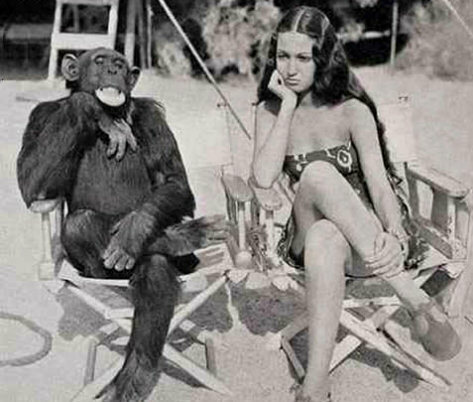 The chimpanzee is the most genetically similar to humans of all species. They live typically in lowland habitats close to the equator with an annual rainfall of at least sixty inches and a dry season of no more than four months. Besides lowland they can be found in deep forest, mixed forest-savanna and higher altitudes. The Association of Zoos and Aquariums recommends a min of 60O F and a max of 85O F with adequate air movement. In The Chimpanzes of Bossou and Nimba we learn that the range of thermoneutral ambient temperature for primates is about 5O C. For humans the range is 25 to 28O C. Also, the average daily maximum temperature inside the Gban primary forest is 25O C in the wet season and 30O C in the dry season. ...and Antarctica, currents flowing freely. This image of the South Pole is very exciting. I was concerned that Antarctica would continue to block ocean currents from the equator and defeat our efforts to bring warmth to that area. With much of it submerged water will flow through pretty well. 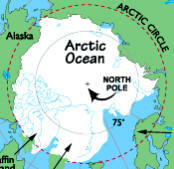 The North Pole has no land, just ocean. You often hear that the current rapid warming is a serious threat to the world's flora and fauna. Assuming global warming is actually happening for the moment, is this a valid concern? "The four biological researchers address this important question in stages. First, they present evidence demonstrating that "recent geophysical studies challenge the view that the speed of current and projected climate change is unprecedented." In one such study, for example, they report that Steffensen et al. (2008) showed that temperatures in Greenland warmed by up to 4°C/year near the end of the last glacial period. 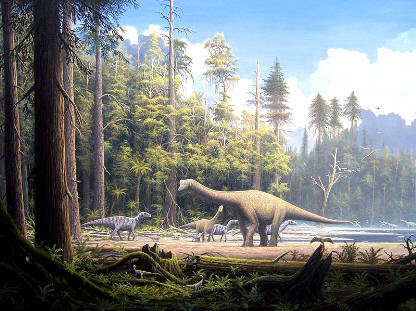 And they state that this change and other rapid climate changes during the Quaternary (the last 2.5 million years) did not cause a noticeable level of broad-scale, continent-wide extinctions of species. Instead, they state that these rapid changes appeared to "primarily affect a few specific groups, mainly large mammals (Koch and Barnosky, 2006) and European trees (Svenning, 2003)," with the result that "few taxa became extinct during the Quaternary (Botkin et al., 2007)." So how were the bulk of earth's species able to survive what many today believe to be unsurvivable?" A species well equipped to survive changing climate as proved in actual field trials. "The bear family, Ursidae, is believed to have split off from other carnivorans about 38 million years ago. The Ursinae subfamily originated approximately 4.2 million years ago. According to both fossil and DNA evidence, the polar bear diverged from the brown bear, Ursus arctos, roughly 150,000 years ago. The oldest known polar bear fossil is a 130,000 to 110,000-year-old jaw bone, found on Prince Charles Foreland in 2004. Fossils show that between ten to twenty thousand years ago, the polar bear's molar teeth changed significantly from those of the brown bear. 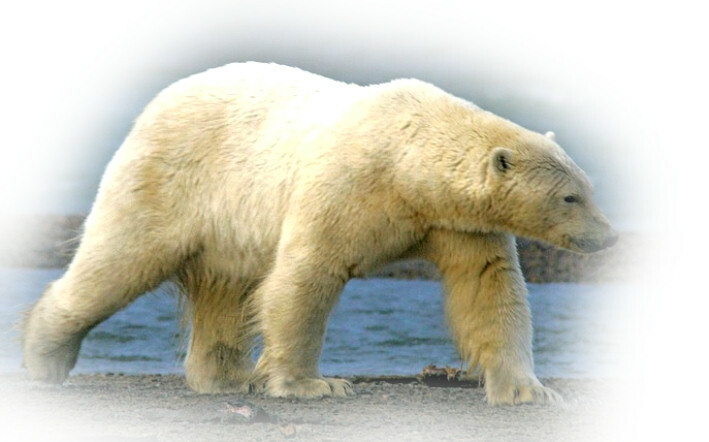 Polar bears are thought to have diverged from a population of brown bears that became isolated during a period of glaciation in the Pleistocene. More recent genetic studies have shown that some clades of brown bear are more closely related to polar bears than to other brown bears, meaning that the polar bear is not a true species according to some species concepts. Irish brown bears are particularly close to polar bears. In addition, polar bears can breed with brown bears to produce fertile grizzly–polar bear hybrids, indicating that they have only recently diverged and are genetically similar." Other sources say the Polar bear appeared about 200,000 year ago. Either way they were here for the last interglacial period, the Eemian, which was warmer than the one we are in. As explained above it has been much warmer in this interglacial. The bears are not as delicate as some imagine. They manage just fine. Let's take this off the list of things to worry about! If it is truly in danger it has nothing to do with temperature. A side note: it's not irrational to feel ambivalent about a wild animal that thinks of you as lunch. Ice Free - Can it be done? "Most climate change predictions have only examined the next hundred years. But now a new, even more long-term model suggests that temperatures could rise as much as ten degrees Celsius by 2300 — creating conditions not seen for 34 million years. "This is one of four scenarios predicted by an international team of climate scientists, who have modeled the next 300 years of climate change based on various possible courses of action. "A general increase of ten degrees is dramatic enough, but the effects wouldn't be the same everywhere, with the polar regions seeing far greater increases than the tropics. In this scenario, Arctic ice would melt completely, and the far northern reaches of Canada, Russia, and Greenland could be covered in plants that are now only found in tropical or southern temperate regions, becoming lush forests like they were back in the Eocene." QUIZ: Prior to the appearance of the Isthmus of Panama 3 million years ago the climate was much the same as today. True or false? For millions of years prior to the appearance of the Isthmus, the Earth's climate was temperate, mild, steady-state with no dramatic differences between the seasons in contrast to today. This one's false. The article above shows that Ice Free Earth is considered a possibility, at least in theory. It remains to be seen if Man has any effect on climate at all, let alone enough to cause the return of the Eocene. Breaking out of the ice age may not be so easy as that. Not with the Isthmus of Panama blocking normal ocean currents. 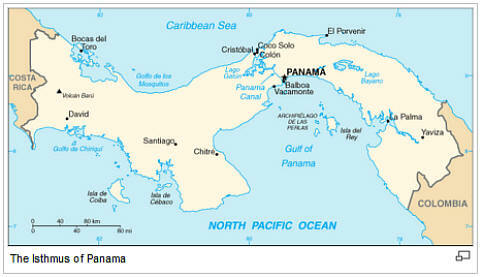 Does a sea-level canal across the Isthmus of Panama sound crazy? Not really, it has long been discussed. "The earliest mention of a canal across the Isthmus of Panama dates to 1534, when Charles V, Holy Roman Emperor and King of Spain ordered a survey for a route through Panama that would ease the voyage for ships traveling to and from Spain and Peru, as well as give the Spanish a tactical military edge over the Portuguese. During his expedition of 1788–1793, Alessandro Malaspina demonstrated the feasibility of a canal and outlined plans for its construction. The ill-fated Darien scheme was an attempt launched by the Kingdom of Scotland in 1698 to set up an overland trade route, but was defeated by the generally inhospitable conditions, and abandoned in July of 1699. Finally, the Panama Railway was built across the isthmus, opening in 1855. This overland link became a vital piece of infrastructure, greatly facilitating trade and largely determining the later canal route. An all-water route between the oceans was still seen as the ideal solution, and the idea of a canal was enhanced by the French success of the Suez Canal (which took 10 years to build the 102 mile canal, more than twice the size of the Panama Canal). The French, under Ferdinand de Lesseps, began construction on a sea-level canal (i.e., without locks) through what was then Colombia's province of Panama, on January 1, 1880. The French began work in a rush, with insufficient prior study of the geology and hydrology of the region. Excavation was conducted at such a steep angle that, in some years, rain-induced landslides poured nearly as much material into the canal as had been removed...In 1893, after a great deal of work, the French scheme was abandoned due to disease and the sheer difficulty of building a sea-level canal, as well as lack of French field experience, such as with downpours that caused steel equipment to rust." "Scientists studying the feasibility of a sea-level canal (not a mile deep, but deep enough) have found that the Pacific at Panama is about eight inches higher than the Atlantic on average due to currents and such. In addition, tidal variation on the Pacific side of Panama is much greater than on the Atlantic side--20 feet vs. 1 foot. That means the Pacific would flow into the Atlantic through the sea-level canal, producing currents that could reach nearly 6 MPH." "The President's expressed interest in sea-level canal routes in Colombia and in Costa Rica-Nicaragua, as well as in two possible routes in Panama, conveys the impression that they are fully competitive. Actually, Panama enjoys a double advantage in the fact that the two best routes are both within her borders. Preliminary studies have favored a sea-level canal excavated by the use of nuclear explosives in eastern Panama close to the Colombian border. If nuclear explosives cannot be used in the construction, then the conversion of the existing lock canal to sea level is for many reasons the best solution. Indeed, it is preferable in any case." More recently, the Department of Nuclear, Plasma and Radiological Engineering, University of Illinois published a paper titled, "Restoring the Global Equatorial Ocean Current Using Nuclear Excavation", by Maagdi Ragheb, August-October, 2009, in i-manager's Journal on Future Engineering & Technology, Vol. 5, No. 1. "Before the last three million years, the Earth's climate enjoyed a steady state mild temperate climatic condition situation with he ocean currents rotating around the globe and evenly distributing the absorbed solar radiation from the water to the land masses...However, tectonic Earth movements caused the Central American Land Bridge to develop, blocking the flow of ocean currents from the Atlantic Ocean to the Pacific Ocean that had stabilized the Earth's climate for millions of years. This land bridge forced the ocean currents into a north-south flow...The diverted oceans currents lead to a more variable climate, with dramatic differences between the seasons. The temperate forests reaching into the Arctic were replaced by a taiga or sub arctic forests characterized by pine trees. Winters became longer and the north and south ice caps formed. The recurrent periods of glaciation and thawing in the last three million years, and the rising of the rising of the Central American Land Bridge may have forced the Earth's climate into a long cycle involving long ice ages followed by short warm periods. Every glaciation period has been accompanied with large species extinctions. "An alternate sea level canal through Panama or northern Columbia, restoring the old ocean currents intercepted by Central American Land Bridge, may become an international global geoengineering project. 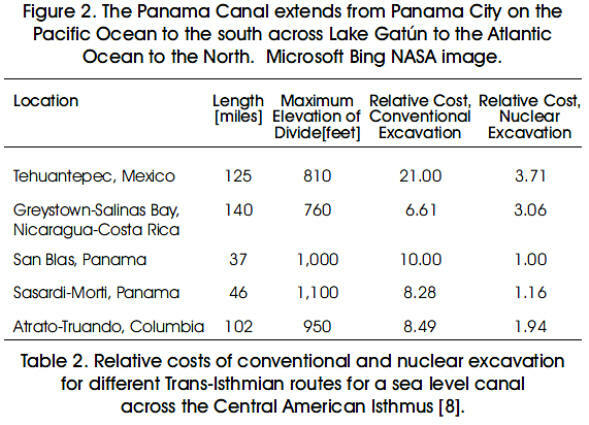 Five different Trans-isthmian routes (Figure 2) and the relative costs for conventional and nuclear excavation for a sea level canal are possible as shown in Table 2...Some previous studies considered canals that were 600 feet wide and 60 feet deep, and canals which were 1,000 feet wide and 280 feet deep. A sea level canal construction would require the use of massive amounts of energy carving hills and mountain ranges. 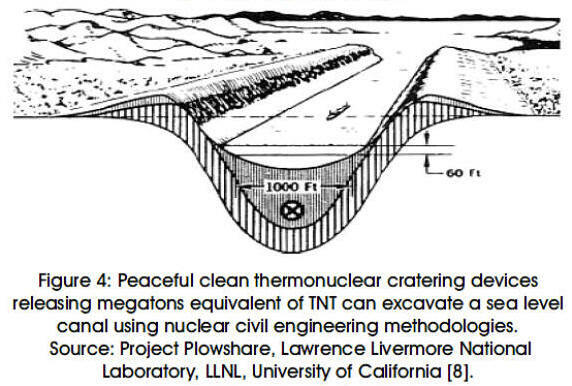 Peaceful clean thermonuclear cratering devices releasing megatons equivalent of TNT may be an economical means of achieving such an ambitious project...In all cases important environmental considerations will have to be addressed. Economical benefits must be allocated by the international community to the populations that would accept the undertaking of such projects in their territory." More study is needed. Will the size of canal so far contemplated be adequate to fully restore the current? If sea levels were to rise 300 feet the entire Panama Canal would be 215' below water, or more, fully restoring the equatorial current. 1. The earth is now in an ice age and has been for almost 3 million years. 2. The earth is now between glacial periods, a brief interglacial. 3. Recent interglacials have been warmer than this. 4. During the past 700,000 years it has been much colder 95% of the time. 5. 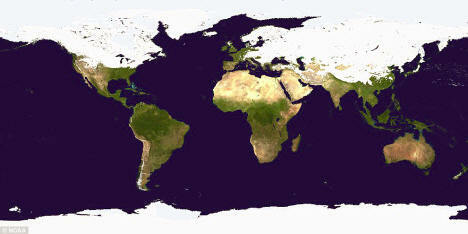 During the past 2.4 billion years the earth has been ice free 72% of the time. 6. Global cooling is far worse than global warming. 7. The last Golden Age ended about 6100 years ago. 8. The key to improving global climate is a sea level canal in Panama. 9. CO2 alone may well not get us out of the ice age. We may not be able to alter climate at all with gases. 10. We need a better understanding of the mechanisms of climate. the Earth and it's climate history. See if what I'm saying is true. The Earth's climate has gone from a worldwide Eden, almost, to a much degraded condition. We have made the best of it, even here in the northern latitudes. We hunker down and get through the winters. How glad we are to see Spring and Summer return! If the status quo continues the big ice sheets will return and blot out the seasons as we know them. If we can raise the average annual temperature safely, we should do so. The risk lies in doing nothing. I suggest a rise of 6 ºC would be ideal. Gradually, over a period of hundreds of years, the temperature and the sea level will rise allowing ample time to make adjustments. ice on your continent is bad." Typical of low lying land that will disappear under the waves when we return the Earth to Greenhouse conditions, Florida, sadly must be abandoned. Had early settlers understood they might have avoided Florida for higher ground. This is not something we undertake lightly. The dislocation and disruption of lives is beyond calculation, but only a small fraction of what will happen with the return of ice sheets. Wipe from the map all of Canada, Alaska and the northern tier of states, covered by ice. Much of the rest of the US will be permafrost and tundra. That's just the start. There will be no safe haven for Earth's billions. Florida's shoreline past, present and future? or will the ice begin to advance again? Florida used to be twice as big as it is now. about 5500 years ago, so it is nothing new. "For much of the geological history of the US, Florida was under water. During this time, the shells of countless millions of sea animals decayed to form the thick layers of limestone that now blanket the state. 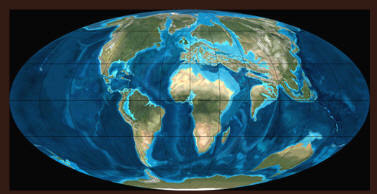 The peninsula rose above sea level perhaps 20 million years ago. Even then, the southern portion remained largely submerged, until the buildup of coral and sand around its rim blocked out the sea, leaving dense marine vegetation to decay and form the peaty soil of the present-day Everglades." "Evidence indicates a trend toward global warming. If the world's temperature warms, this may mean that the sea level will rise along most of the world's coastlines. Florida has an extended coastline and many major cities are near the coast. Any rise in sea level poses a threat." "Florida is a huge plateau, much of it barely above sea level. The highest point in the state is believed to be a hilltop in the panhandle, 345 ft (105 m) above sea level, near the city of Lakewood, in Walton County. The Mean Elevation of the state of Florida is only 100 feet above sea level. The elevation of the Miami area never rises above 40 ft (12 m) and averages at around 6 ft (1.8 m) above mean sea level in most neighborhoods, especially near the coast." If we are able to return to Old Peron conditions much of Miami will be inundated by the rise of twelve feet in sea level. In return we avoid an ice age and greatly improve the climate of the Earth. Florida's salubrious subtropical climate moves far to the north and south. If we achieve an ice free Earth sea level will rise 300 feet or more and the poles will be habitable. About nineteen million people will, over time, need to be relocated. About nine million housing units will need to be replaced. There will be places for them to go, to rebuild and start anew. Ice Free Earth Now supports the Terraforming of the Earth to achieve normal and healthy climatic conditions, in perhaps a hundred years, similar to those of the Old Peron with about a twelve foot sea level rise. Eventually approaching Eocene conditions. we have already begun the slide into the next glaciation. Others say it's not due for 3,000 years. Some say it will take thousands of years to develop. ten years perhaps, maybe only months. undertaken by mankind. Not only must we help reinstate the normal climate of the Earth, we must relocate millions and millions of coastal dwellers and infrastructure to higher ground. Why? Because it was a mistake to build there in the first place. An understandable and costly mistake that can not be allowed to dictate what Earth's climate will be. Before doing anything IFEN would like to see our best minds undertake a study of the planet's climate mechanisms. Only when we have a good understanding of the climate system should action be taken. 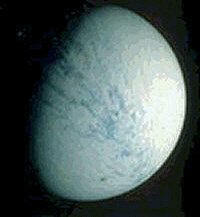 let alone another snowball Earth. I guarantee one or the other is coming if we do nothing. Can we stop it? We must. Will there be problems? Sure. Will some species need to adapt? Of course. We can make nearly the entire Earth once again habitable and supportive of life. The dinosaurs were not able to survive the forces of nature. Nor where the Wooly Mammoth, Wooly Rhino and many others. Our fate is yet to be determined. If the ice age returns in full force humans will die in very large numbers. There will be no escape from the winter without end. Before the ice forms there will be snow storm after snow storm. By the time we realize what is happening it will be too late. Travel will grind to a halt. Crops will not grow. Wild life will perish. Only those near the equator will have a chance. Even there it will be no picnic. 1. If climate science consensus is right, then let's get serious about CO2. 1,000 ppm is attainable and a 6 ºC increase in temperature. 2. Reopen the connection between the Pacific and Atlantic oceans through Central America to reestablish ocean currents. 3. Enlarge the openings to the Arctic ocean to augment the currents there. night side on ice sheets, caps and glaciers to promote melting, especially Antarctica. 6. Controlled, incremental release of methane hydrates from the shallow Arctic shelf and deep ocean deposits, possibly as an energy source. Do we really want this for future generations? Each winter in northern latitudes we are reminded that glaciers will one day inexorably advance. Glaciers begin very simply when summer warmth is unable to melt all of winter's snow. How delicate is the balance. It starts snowing and doesn't stop. The snow doesn't melt; it keeps building up. By the time you realize there's a problem, it's too late. How many can ski to Mexico? Concern has been expressed about the stability of the West Antarctic ice sheet (WAIS). Vaughan & Spouge argued that the "WAIS most likely will not collapse in the next few centuries." In a recent inaugural article for members of the National Academy of Sciences elected in 2005, Timothy Lenton and others suggest that a collapse of the West Antarctic ice sheet could occur within a millennium. Specifically they state "Although the timescale is highly uncertain, a qualitative WAIS change could occur within this millennium, with collapse within 300 years being a worst-case scenario. Rapid sea-level rise (>1 m per century) is more likely to come from the WAIS than from the Greenland ice sheet." Greenland's ice sheet contains enough fresh water as ice to raise sea level worldwide by 7 metres (23 ft). Greenland may become warm enough by 2100 to begin an almost complete melt over more than a 1,000 years. James E. Hansen suggests that inadequate attention is being given to this issue,. However, research comparing data from the Eemian period suggests that the Greenland ice sheet will remain at least in part at 5C. "(M)ethane hydrate also offers the potential to become a valuable source of clean energy, as burning methane emits much less carbon dioxide than other fossil fuels." As an USAF pilot in 1970 I flew a C-141 to Sondrestrom Air Base, Greenland. Landing required flying up a long fjord. The only way out was back the way we came. In the cafeteria was available a local delicacy...buried eggs. When ready they have turned brown inside. I didn't try them. 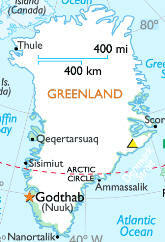 The government of Greenland took ownership of the base in 1992. It was deepest winter. Cold, barren, desolate. When the current interglacial period slides into the next glacial period, much of the world will be like Greenland or buried deep ice under ice. Thanks for your support of this site. No other funding is received.